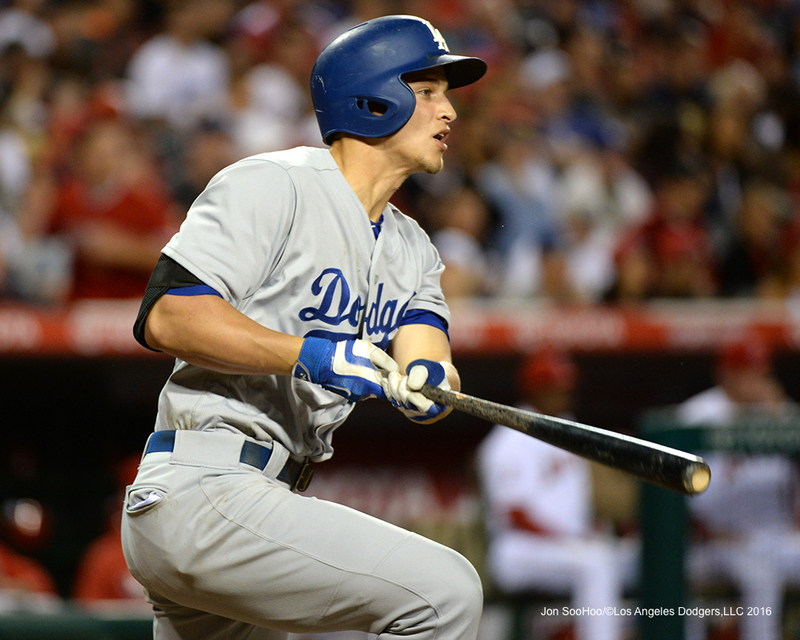 It’s doubtful many people realize the kind of month that Corey Seager just had. 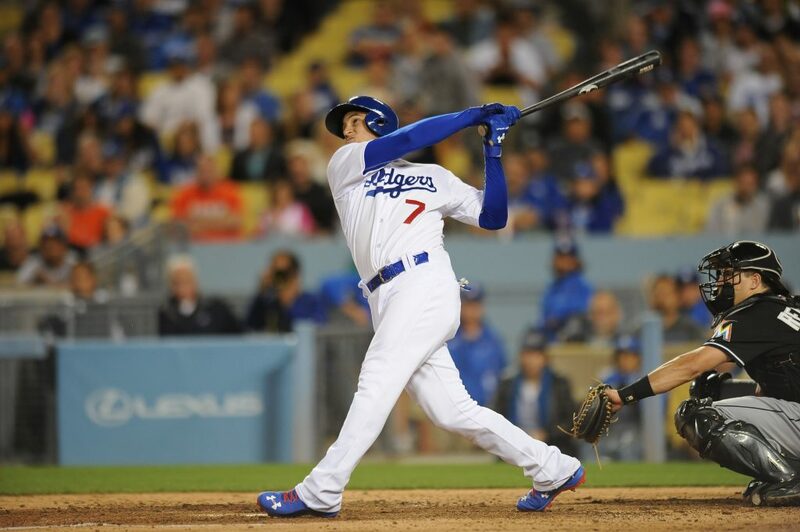 The 22-year-old’s three-run homer in the ninth inning of tonight’s 5-0 Dodger victory was his seventh round-tripper of the month, giving Seager a share of a franchise record. Seager tied Hanley Ramirez for the most homers by a Los Angeles Dodger shortstop in a single month, according to my research at Baseball-Reference.com. Ramirez hit seven in August 2012, his first full month with the Dodgers after being acquired from Miami. (In fact, Ramirez hit all seven of his in the second half of that month, starting on August 16). 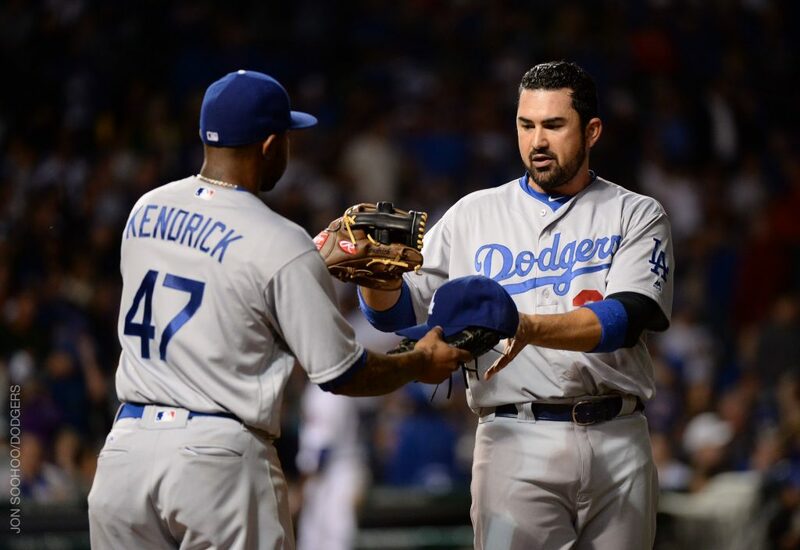 Eighth-inning RBI heroes Howie Kendrick and Adrian Gonzalez. Jake Arrieta bent, and an inning later, the Cubs broke. In his first start against the Dodgers since his August 30 no-hitter, Arrieta pitched seven more shutout innings. But he didn’t no-hit them (pop the champagne), and in fact, barely escaped the seventh inning after walking the bases loaded. Once he was out of the game, the Dodgers struck, with a trio of singles from Chase Utley, Corey Seager and Adrian Gonzalez breaking a scoreless tie in the eighth — as well as ending 26 consecutive scoreless innings against Chicago dating back to last season — and propelling the Dodgers to a rain-delayed 5-0 victory over the Cubs at Wrigley Field. The Dodgers not only answered the Cubs’ one-hitter Monday with one of their own (retiring the final 19 batters), they evened their record on their road trip against last year’s National League pennant finalists to 3-2, with two games to go. In those six games, Gonzalez (2 for 4) is 10 for 19 with two walks. Howie Kendrick capped an eight-pitch at-bat with an opposite-field sacrifice fly for the Dodgers’ second run, and a three-run homer in the final inning by Corey Seager (3 for 5) — his team-leading ninth of the season — put the game all but out of reach. While Arrieta came away with a no-decision, and in fact allowed only two more hits in this start against the Dodgers than he did in his last one, the loss nevertheless ended a 23-game Cubs winning streak in games their ace has started, which had tied a Major League record, according to ESPN Stats & Info. Alex Wood, whose most recent start was delayed three days because of left triceps soreness, is now going on the 15-day disabled list with left posterior elbow soreness, and 19-year-old Julio Urias is returning to the Dodgers. Pending any shuffling of the Dodgers’ rotation, Urias would be scheduled to pitch Saturday in Los Angeles against the Braves. Dodgers at Cubs, 5:05 p.m. Note: Yasiel Puig was a late scratch with a sore left hamstring. Two years and seven months after he was signed, Alex Guerrero has been designated for assignment by the Dodgers. The 29-year-old Guerrero has spent the 2016 season on the disabled list because of a left knee contusion. With his minor-league rehabilitation assignment expiring and no place for him on the active roster, the Dodgers have removed him from the 40-man roster, with 10 days to determine his fate. 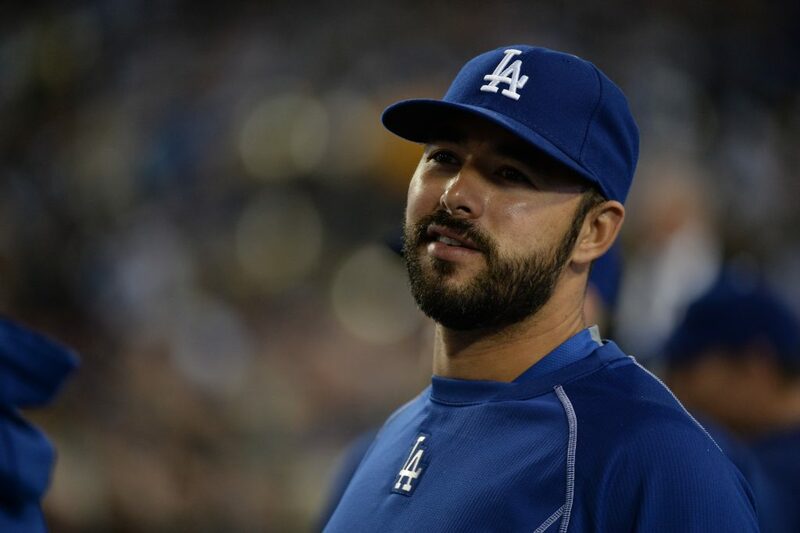 Andre Ethier’s recovery from a March 18 right tibia fracture has slowed, and his expected June return has been delayed, Dave Roberts told reporters today. Roberts said that there isn’t much new with Ethier, who hasn’t been running at full body weight. 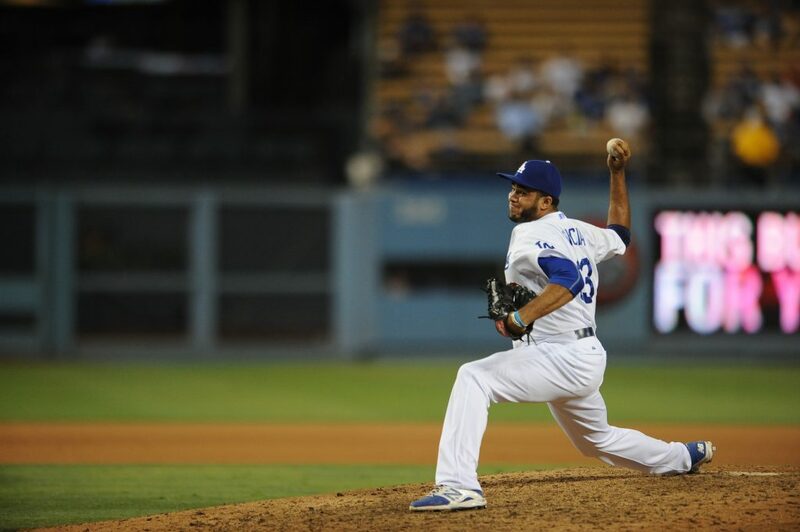 Roberts added that he has exchanged texts with Ethier and that he is anxious to get back to action. A day before they face Jake Arrieta for the first time since he held the Dodgers hitless, the Dodgers were nearly held hitless. 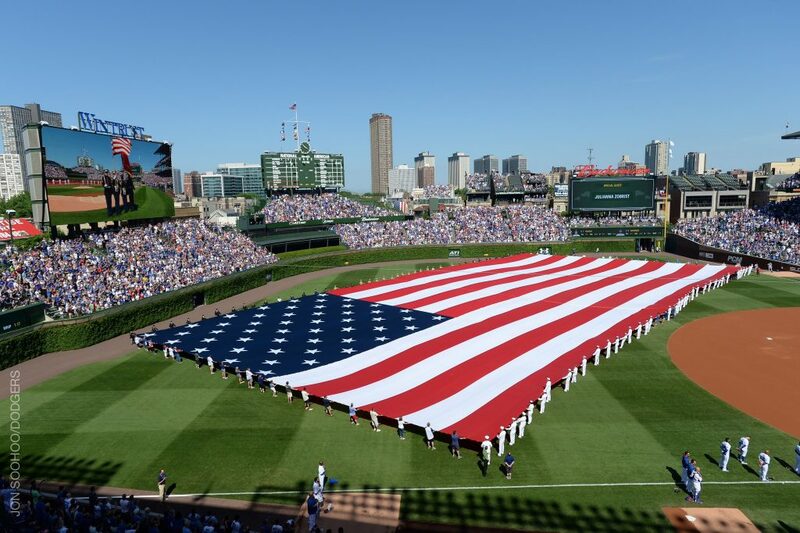 Justin Turner’s sun-aided bloop single, which fell between three Cubs fielders in the top of the first inning, was the only hit by the Dodgers in a 2-0 Memorial Day loss at Chicago. Five pitchers combined to retired the final 25 Dodgers of the game. In their past two games against the Cubs — Arrieta’s August 30 no-hitter and today — the Dodgers are 1 for 55 at the plate with two walks and 23 strikeouts. Adrian Gonzalez’s walk after Turner’s single was the last Dodger baserunner. Alex Wood and three Dodger relievers pitched well enough to keep the Dodgers in the game, but not enough to overcome the Cubs’ pitching dominance. 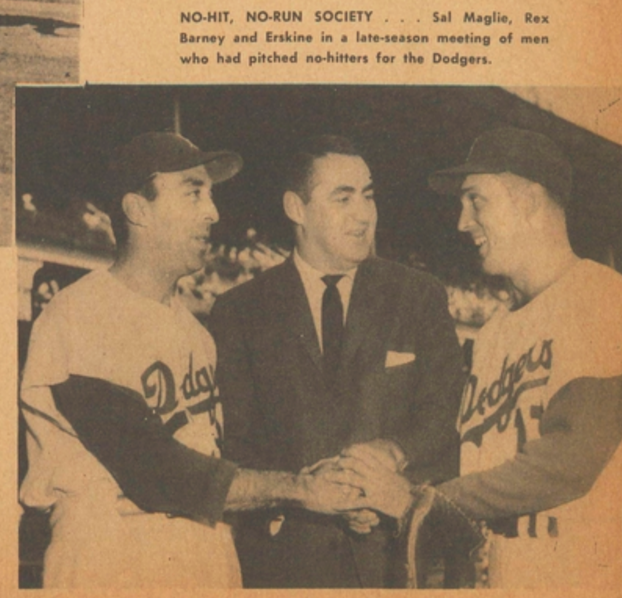 Section from Carl Erskine’s page in the 1957 Dodger Yearbook. Dodgers at Cubs, 2:05 p.m.
Michael Tackett of the New York Times had a fine article over the weekend on 89-year-old Dodger great Carl Erskine, and the close, lifelong relationship he has had with childhood pal Johnny Wilson. Their hometown of Anderson, Indiana paid tribute to the 88-year-old Wilson with a statue, and Erskine was key to making the honor happen. One white child, one black, they were bound from that point by their love of sports and their meager economic circumstances during the Depression in this north-central Indiana factory town. The friendship with Wilson was Erskine’s bridge to his warm relationship with Jackie Robinson, whom he joined on the Dodgers in Robinson’s second season after breaking Major League Baseball’s color barrier. Click here to read the whole story. This year marks the 70th anniversary of the Dodgers signing Erskine, after he served in the Navy at the tail end of World War II. Clayton Kershaw completed his extraordinary May with a triumphant finish, if you don’t mind a mildly disappointing footnote. Kershaw raised his strikeout total since May 1 to 65 — a total not exceeded by a Dodger pitcher in a single calendar month since Sandy Koufax in 1965. 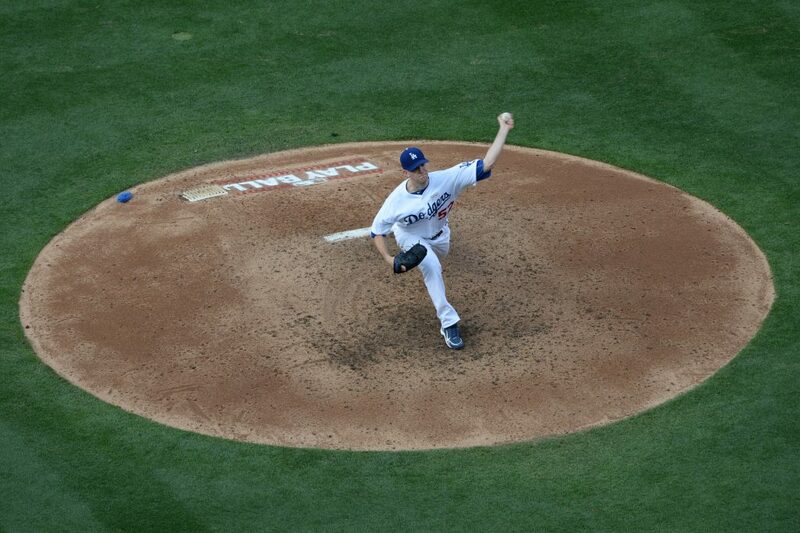 For the fourth time in six May starts, Kershaw struck out at least 10 and walked none. He averaged 8.3 innings per game. He allowed 24 baserunners in 49 2/3 innings. His ERA for the month: 0.91. The 28-year-old phenomenon also set an MLB record by striking out his 100th batter before walking his sixth — Cliff Lee had the record with seven walks for his first 100 strikeouts in 2010 — and currently has a 21.0 strikeout-walk ratio. 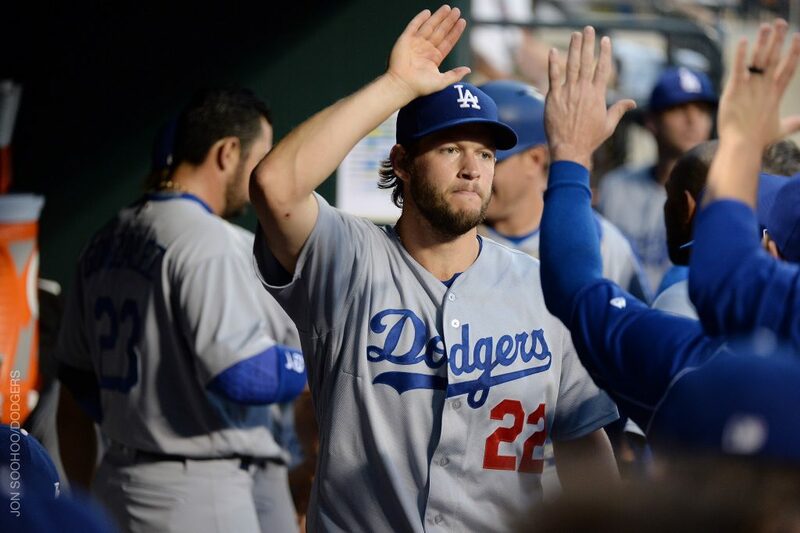 Kershaw just can’t boast about his second career 6-0 month. 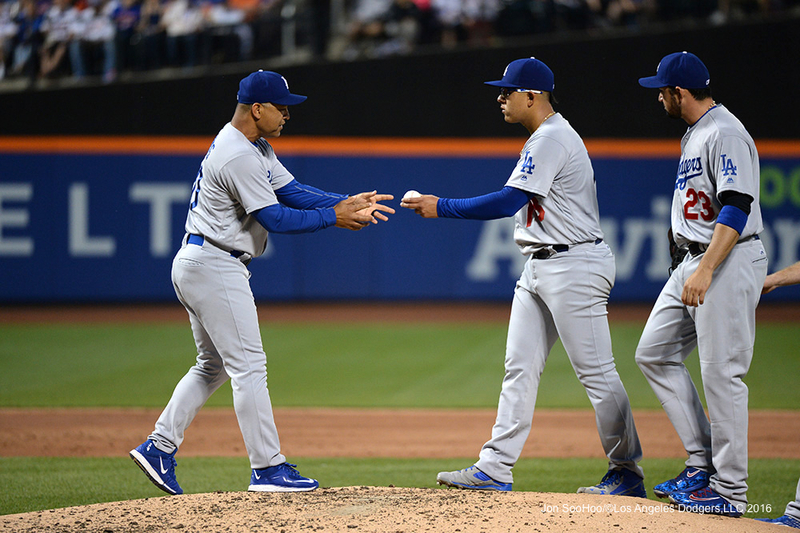 Leaving a game mid-inning for the first time this season, Kershaw settled — happily, one can bet– for a 4-2 Dodger victory, but only after Mets tied the game off reliever Adam Liberatore with two out in the bottom of the eighth. Adrian Gonzalez’s two-run single in the top of the ninth, and Kenley Jansen’s three-up, three-down save in the bottom of the inning, gave the Dodgers and Kershaw the ending they were counting on. Dodgers at Mets, 4:15 p.m.
Julio Urias said he had the best day of his life when he made his Major League debut Friday. His next big-league appearance won’t come right away, however, because the Dodgers have decided to option him back to Triple-A Oklahoma City. Right-handed reliever Casey Fien will take Urias’ spot on the 25-man roster, as well as the 40-man roster spot of minor-league outfielder James Ramsey, who has been designated for assignment. Urias was forthcoming in his postgame comments following his 81-pitch, 2 2/3-inning start in New York, according to Ken Gurnick of MLB.com, including the admission that he was nervous. In more than 100 years, no reliever had ever entered the ninth inning of a game against the Dodgers with a four-run lead, blown the lead and won the game. But that’s what happened when the Mets’ Jeurys Familia gave up a bases-loaded walk to Yasmani Grandal and a three-run double to Chase Utley (the latest memorable moment for Utley) – then emerged the winning pitcher on Curtis Granderson’s home run off Pedro Baez, 6-5. Via Baseball-Reference.com, the closest equivalent was September 27, 2011, when Arizona’s Micah Owings started the 10th inning of a 1-1 game against the Dodgers and allowed five runs before the Diamondbacks scored six in the bottom of the inning off Blake Hawksworth and Javy Guerra, capped by a Ryan Roberts grand slam. Julio Urias is still a precocious teenager and a pitching prodigy. But the mania will have to wait at least a game. 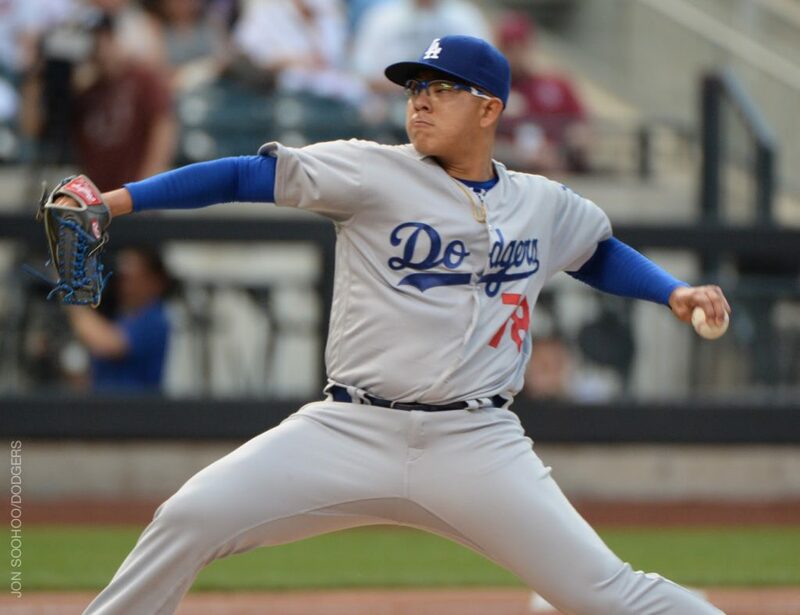 Displaying consistent velocity but inconsistent command at 19 years and 289 days old, Urias lasted 2 2/3 innings in his Major League debut, leaving with the Dodgers trailing the New York Mets, 3-1. With three strikeouts, Urias tied a Dodger record for a teenager in his first game, but he also allowed five hits and walked four and even in his best inning, couldn’t find the consistency he needed to last longer. Dodgers at Mets, 4:10 p.m.
Yimi Garcia, who went on the disabled list five weeks ago with right biceps soreness, has been transferred to the 60-day disabled list in order to make room on the 40-man roster for Julio Urias, whose contract was officially purchased by the Dodgers ahead of his MLB debut tonight. Garcia had a 2.35 ERA in 7 2/3 innings this season when he entered the eighth inning of a game at Colorado with the 5-5 on April 22. In two-thirds of an inning, the 25-year-old righty gave up a walk, single and two-run triple to Brandon Barnes. 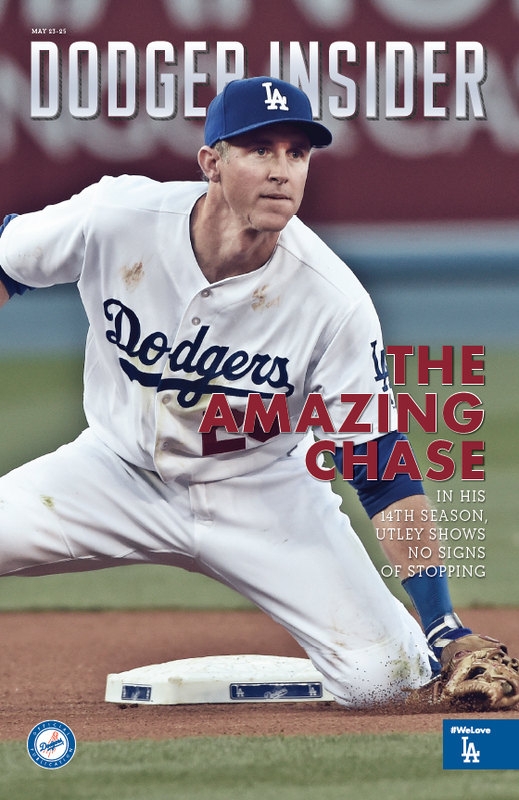 In the cover story of the most recent Dodger Insider magazine, we explored the resurgent — or maybe he’s just always surgent — Chase Utley. For the 36th time this season, Utley is the leadoff hitter for the Dodgers. He leads the Dodgers in on-base percentage, but he does so much more. 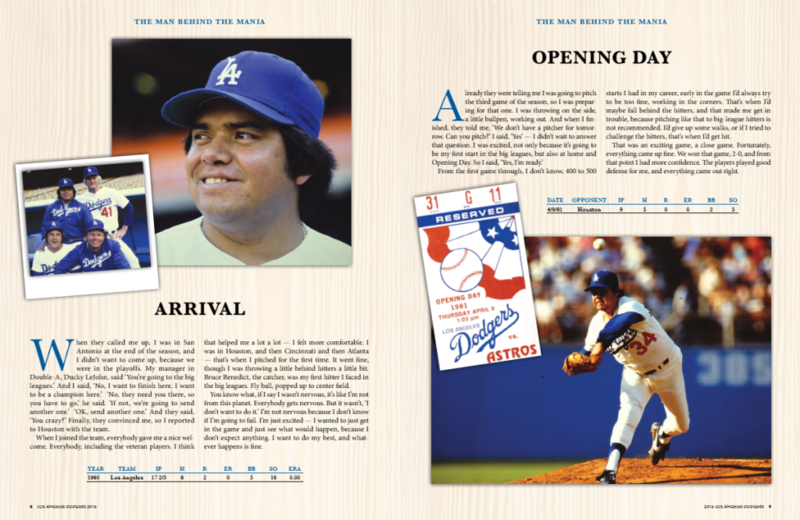 For our special section in the 2015 Dodger Yearbook dedicated to him, Fernando Valenzuela described his initial promotion to the Major Leagues in 1980 and the unforgettable start that launched Fernandomania in earnest in 1981. Click the image above to enlarge.